A well cut pair of black trousers are such an important part of any wardrobe, and this Marina Rinaldi version fits the bill perfectly. We love the tapered cut and elasticated waist for the perfect fit and comfort. It makes the ideal partner for all your statement shirts and sweaters, and of course works perfectly as a suit with the coordinating Marina Rinaldi jacket. 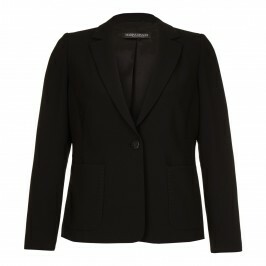 Straight leg tailored trousers in black with front zip and elasticated waist in the back. 64% Triacetate, 36% Polyester. Dry clean only.